Built to provide maximum agility and traction over any terrain, 5.11 Tactical Boots are a longstanding staple of law enforcement and military units throughout the world. 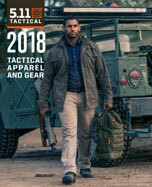 Our high performance line of surprisingly comfortable tactical boots incorporate the unique 5.11 Shock Mitigation System, providing increased kinetic absorption and rebound that enhances stamina, stability, and balance. Available in both 6” and 8” variants, 5.11 tactical boots are available in a wide range of sizes and styles to suit any application or environment. Whether you need a reliable pair of cushioned tactical boots for patrol duty or hardened men’s military style boots for deployment in a hostile environment, tactical boots from 5.11 combine modern materials, precision engineering, and our legendary commitment to quality.